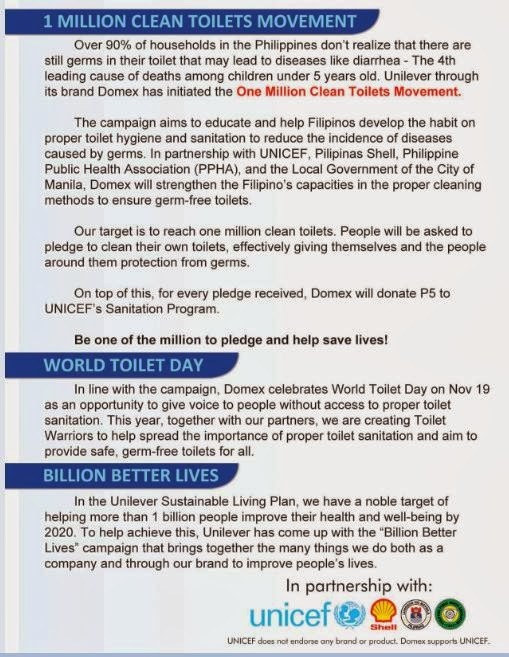 In support for World Toilet Day celebrations, Unilever through its number one germ-killer brand Domex, launched its nationwide initiative to promote better bathroom sanitation dubbed as the “One Million Clean Toilets Movement” last November 5th at Patio Victoria in Intramuros. By increasing the public’s awareness on the importance of maintaining proper toilet sanitation through a series of year-long cleaning and education initiatives, the “One Million Clean Toilets Movement” campaign aims to encourage a culture of cleanliness starting with a multi-sector partnership with UNICEF, the Philippine Public Health Association, the City of Manila and Pilipinas Shell. It aims to collect a total of one million pledges from private households to conscientiously maintain their own clean, safe, and hygienic bathrooms by the next World Toilet Day in November 2014. 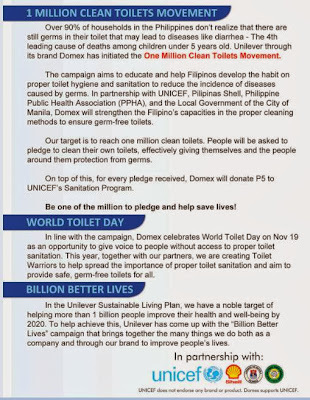 Individuals who will pledge to support the One Million Clean Toilets Movement via the Domex Philippines FB Page will also help grow a global fund to help improve access to basic sanitation in areas of need all over the world as Domex will donate P5 to UNICEF’s Sanitation Program for every pledge received. Advocacy partner UNICEF provided an overview of toilet sanitation in the country, revealing that diarrhea is the third leading cause of child illness and fourth leading cause of death of children under five years old. The organization maintains an active water, sanitation, and hygiene (WASH) program, which focuses on increased household demand for basic sanitation and improved hygiene practice, to combat the prevalence of diarrhea and intestinal worm infection. There are about 2 million bacteria per inch found in a bathroom and yet over 90% of local households are unaware of proper toilet hygiene and sanitation practices. “Evidence shows that improving WASH conditions improves children’s health and academic performance. Proper sanitation is crucial to securing their bright future, which can be achieved by collaborative, multi-sectoral efforts.” said UNICEF WASH Specialist, Dr. Mike Gnilo. UNICEF and Domex have previously teamed up in 2012 for World Toilet Day celebrations and a public restroom clean-up program. “Good hygiene practices are learned at home, and what every household must understand is that proper sanitation is a necessity, not a luxury,” said Domex brand manager Dennis Chua. “Using common cleaning products such as detergents and bleach may result in clean surfaces, but without germ-killing agents, they cannot provide total disinfection. Regular use of a specialized cleaning product can significantly decrease levels of virus contamination, and minimize the contraction of illnesses like influenza, diarrhea, and hepatitis,” Chua added. Imagine how many fewer waste treatment facilities would be needed if only half of all homes used best composting toilet instead of flush toilet systems!